This Eickhorn Control Tag shows some age and wear, but remains intact. The once white string has toned a bit brown and there is a curl on the end that was once attached to a dagger. The metal tag is a two piece affair, with red paint. he paint shows some scuffing and wear but it mostly intact. One side of the tag is marked with the 1935-41 Squirrel trademark, as well as the words "Original Eickhorn Solingen Ges Gesch". The other side reads "Eickhorn Tradition Qualitat". The original paper insert is long gone. A fine, original Eickhorn Tag here. This Krebs Control Tag is constructed from an oval of aluminum foil, with a printed blue surface on both sides. It reads "Carl Julius Krebs / Solingen". In the center is the Crowned "K" trademark of the firm, as well as a date of "Seit / 1866". The string is a two tone blue and white example and remains in excellent condition. If you are fortunate enough to have a mint Krebs dagger this tag would undoubtedly make the ultimate addition. This WKC Control Tag is constructed of gold foil. Printed in red on one side is the name of the firm and the Knight Head trademark of the firm. 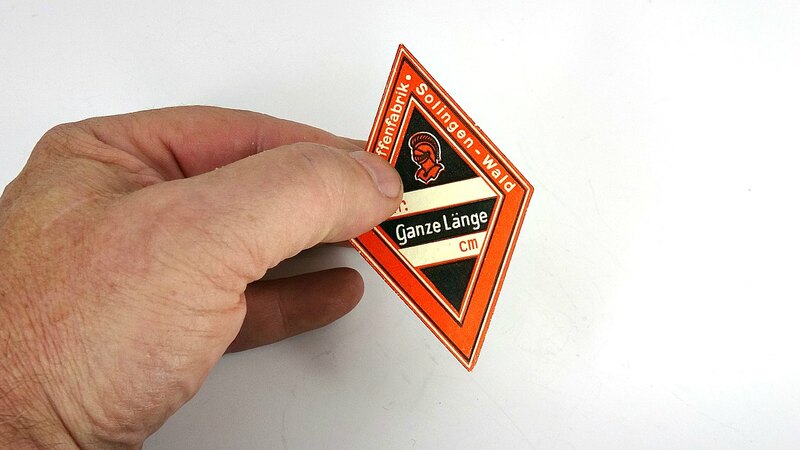 The other side of the tag reads, "Garantie / für / Wertarbeit", or "Guaranteed (for) Workmanship". The original string is a red thread that remains in good condition. A choice example here, perfect to dress up your mint WKC Army Dagger. An exceptional Control Tag here, just perfect to complete your mint WKC Army Dagger. Printed on the tag is the 1933-1935 Eickhorn trademark; a seated squirrel holding a nut in his paws. Below this is a series of labeled lines so that the details of a given sword could be filled out by hand; "Nr" for the model number, "Klingenbreite" for blade width and "Klingenlänge" for the blade length. I have never seen a sword tag without this early logo so we can assume Eickhorn simply the same tag throughout the period. A very fine, original example here, with an exceptional, eye-catching design that cannot fail to dress up even the most humble sword. This WKC Control tag is diamond shaped and measures about 3 inches long. The back is glued like a postage stamp; presumably it was pasted to the paper wrapper on a new sword. In the center of the diamond is the red Knight's Head trademark of WKC. Below this is "Nr" and a space to fill in the model number. Further down is a space to fill in the "Ganze Lange", or "Full Length. The firm's name and location is visible in the red border of the tag. An interesting item here, and the first of the type I've seen. This storage bag is constructed from gray wool. There is some moth damage here and there, as well as some small holes on the upper areas of both sides. It measures 36 inches long so it will accommodate only a rather small degen. The bag has a good working zipper and the leather chape remains in excellent condition. A perfect opportunity to dress up you degen here, as well as preserve it in a period bag. These cloth hilt covers are made of a tan felt material. They cover is sized so that it would fit over any hilt. It is complete with a fold-over flap with a working snap. Printed on the face of the cover is the 1935-41 Eickhorn trademark done in red, This felt cover does not appear to have been ever issued. A beautiful item to display with a mint hilt sword from Eickhorn or a good way to keep your hilt in mint condition by keeping the cover over it. These sword covers used to be around years ago and this is the first time I've seen them in many many years. A very rare and desirable accoutrement here. This Sword Sling, as it is in white leather, would have been used for parade dress. The leather shows quite a bit of age and cracking, but it still sound and would still be fine to display with the proper sword. 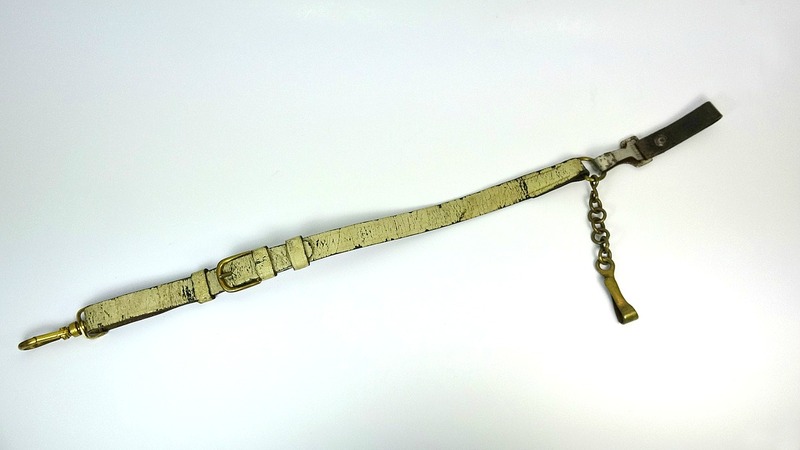 It is about 12 ½ inches long, with a brass buckle, snap, and “D” ring. There is a regain chain and hook attached to the “D” ring. 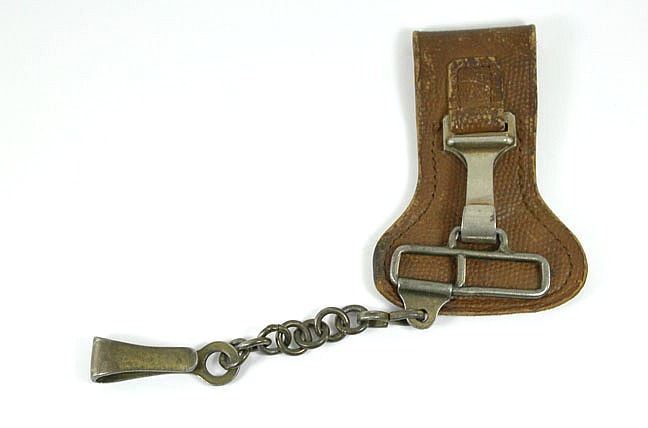 Accompanying the sling is a brown leather belt loop with a “dog leash” clip. A difficult to find accoutrement here, and perfect for an early Army or Navy sword. This SS Degen Hanger is a very desirable accouterment. It measures 14 inches long and was used for formal SS dress. The sling hanger has a black leather belt loop attached with a wire hook to the top of the brocade. The brocade is silver, with twin black lines that run the length. The brocade is sewn to backing of black leather. This leather remains in excellent condition. There is a large square silver buckle at the bottom, and a snap clip is attached to the reverse of the black leather portion. The snap clip is marked with an anchor on the reverse. There is also a nickel chain and regain hook attached to the upper portion of this sling. A very rare brocade hanger here, and a great item to complete a nice SS Degen. 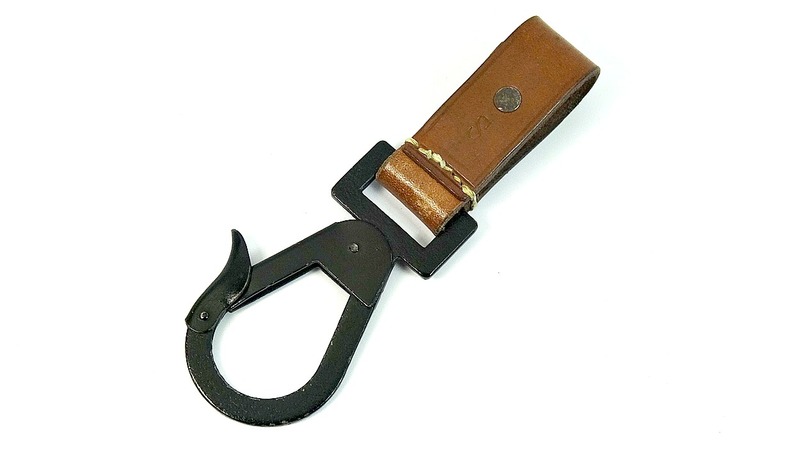 This SS Utility Belt Hook is attached to a brown leather belt loop. I don’t know the function of this hook, but obviously it was designed to carry some type of heavy gear carried by Waffen-SS troops. The leather used to construct this piece is in choice, pristine condition. It is a fine shade of light brown, and is stamped “S” on one side and “SS 48/35 RZM” on the other. The original black paint still covers the hook, with no signs of wear. 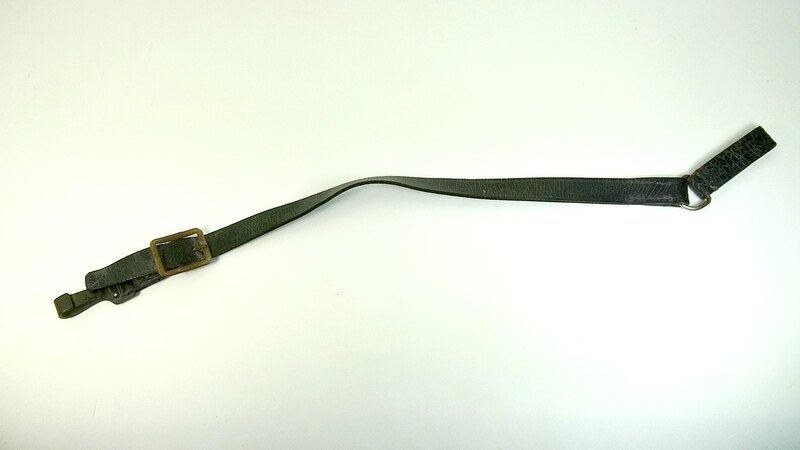 This black leather Sword Sling measures about 20 inches long overall. The leather has some cracking but is generally sound and supple. The sling strap consists of a belt loop with a “D” ring at the top. The strap itself has a rectangular, nickel-plated buckle at the lower end, backed up with a separate leather strap with a black sword snap clip. 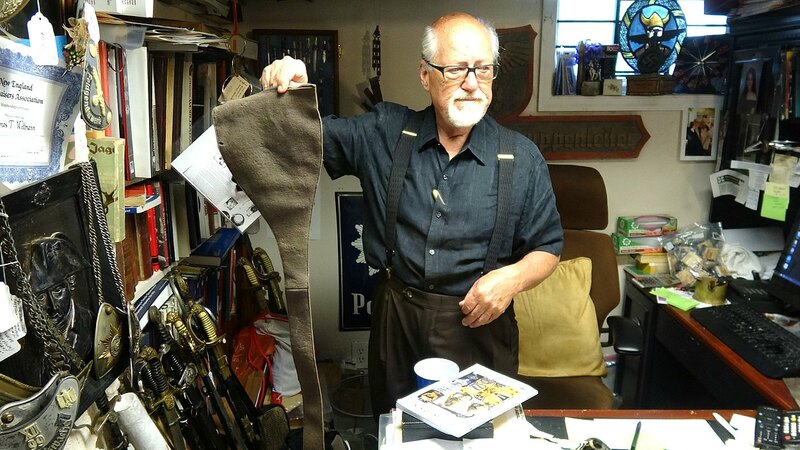 These sword slings are very difficult to come by and would do much to dress up an SS or Police degen. This Sword Hanger is in two pieces; the top portion is a black leather belt loop and the lower in a teardrop shape. They are joined via an aluminum “D” ring. The total length of this rare hanger is 9 ½ inches. The lower teardrop is of matching black leather and is in choice condition. It has a fold-over at the top with a leather retainer loop, adjustable button holes and an aluminum boss. The lower portion of the hanger has a leather strap retained by a rivet which holds a pebbled aluminum snap clip. The reverse of this snap clip is marked “DRGM”. The reverse of the hanger has a fine green felt backing. A great accoutrement here to complete a Police or SS Degen. This rigging would have been suspended from the small belt that was worn by Army Officers under their tunic. It is of brown leather, with a good pebbled finish. Attached to the hanger is a nickel-plated snap clip. In turn a closed-style box clip and regain chain/hook assembly is attached to the snap clip. This is the first example I've seen in this fashion, but it a very effective retention method and should be of keen interest to anyone looking for rare sword accoutrements. This Eickhorn Sword Tag is in completely mint condition. The tag is quite large, being about 4 inches by 2 inches. Printed on the tag is the Carl Eickhorn logo used from 1933 to 1935, and below are lines and abbreviations indicating the model number, blade length and blade width. There is a grommet at the top that would have retained a string. This type of tag is rarely seen and would make a great addition to a mint condition Eickhorn piece. Despite the fact that the trademark is the 1933-35 variant, this type of tag was also used on later made swords. This black leather teardrop hanger measures about 7 ½ inches in length. This piece was specially designed to accommodate a clamshell bayonet. At the top of the hanger it is folded over with adjustable button holes and a boss. The upper hanging assembly consists of a nickel-plated “D” ring. 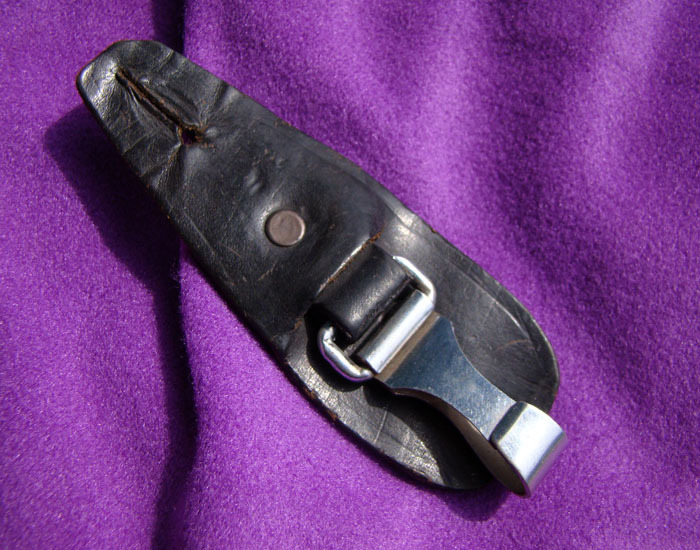 There is a leather strap sewn to the lower portion of the hanger which enclosed a specially made oval ring which would fit under the clamshell. The reverse of the hanger is a lighter brown color. This is an extremely rare accoutrement and perfect for those of you who might collect clamshell variants. 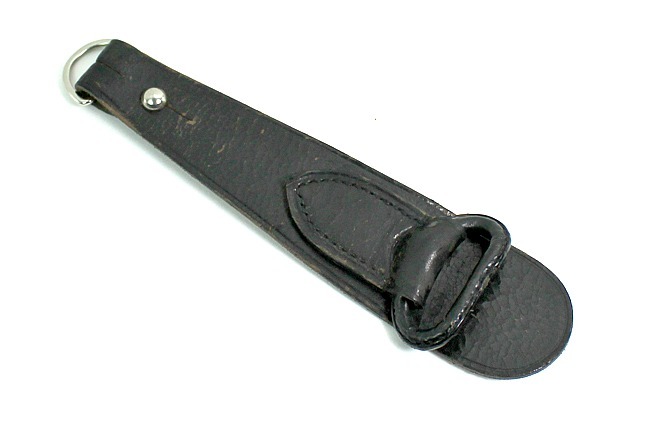 This brown leather Army Sword Hanger is seven inches in length. It is a heavy duty item which provided plenty of security for the original wearer’s sword. 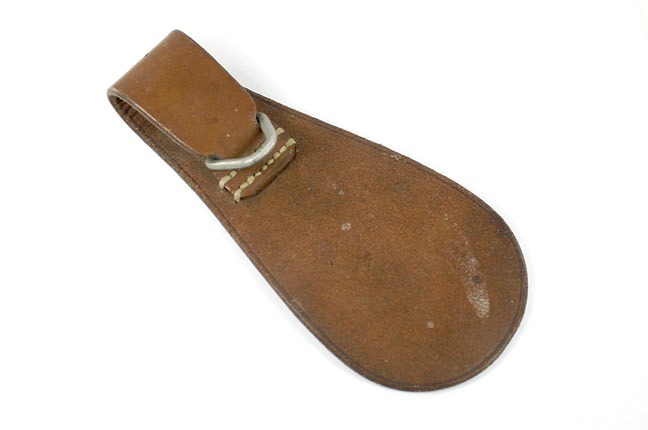 It is composed of a smooth brown leather with teardrop shape at the bottom, and at the top it is folded over and stitched to make a belt loop. The belt loop is also notched to include a special ring which would be for attaching to the sword. The ring is a closed example so there would probably be a snap clip arrangement used with the carrying ring of the sword. This teardrop is stamped on the reverse with an oval having the producer’s original name and other information, “Landes / Liederungsgenoss S. Sch. 1936”. An excellent accoutrement here to display your sword. This shoulder harness consists of a gray canvas-like strapping with adjustable nickel-plated belt buckle. At the bottom of the harness is sewn brown leather to which is attached a nickel-plated “D” ring. Attached to the “D” ring is a regain hook and chain assembly of matching nickel. These harnesses were worn over the shoulder and were used to suspend a sword from. 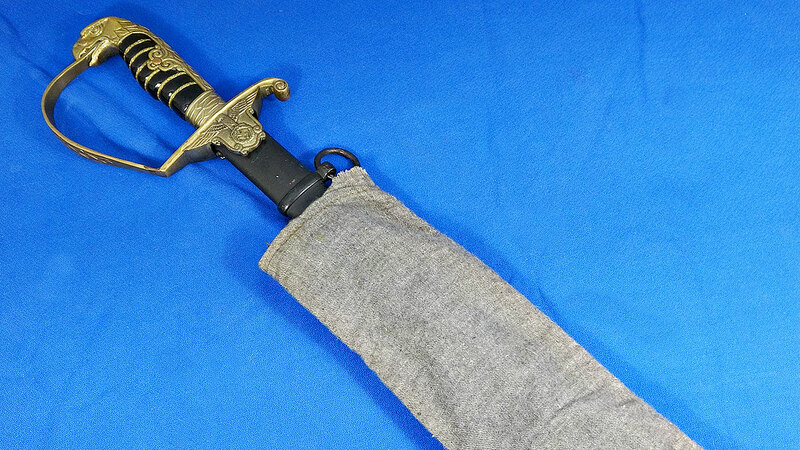 A nice item here for a sword collector, or something to complete a mannequin display. This SS/Police Sword Hanger is different from any I have seen in the past but nevertheless is absolutely original. The hanger is only about 5½ inches in length. It consists of a belt loop with a teardrop attached to the loop. Riveted to the teardrop is a small leather loop which retains a nickel-plated snap clip. The accoutrement shows some age and wear overall but would still make a sound example to either attach to a degen or display with one. This black leather Teardrop Hanger measures only about 5-inches in length. The hanger is set up with a buttonhole at the top area which apparently connected some other belt style loop. I do not, offhand, know what type of loop this would connect to. The leather is still in good condition having a good black color. Connected to the lower portion of the teardrop is a nickel-plated unmarked sword snap clip. A good accoutrement here to hang onto the loop of your Police or SS sword. The Russian Naval Belt and hanging straps is very similar to that used by the Germans. In fact, when the czar came to visit Wilhelm in 1901, Wilhelm admired these hangers as well as the dirks worn by the Russians and basically the Germans copied the design. This naval dress belt has the traditional black moiré surface with a black velvet backing. It is fitted with slides which have anchor designs surrounded by a wreath with a star at the top. There are two slides each having eyelets for the connection of the hanging straps. The buckle is a matching brass beauty also featuring a wreathed fouled anchor with star above. The hanging straps are the identical material having buckles with each end portraying a fouled anchor with wreath and star at the top. The hanger shows some wear to the material but no fraying and the brass parts throughout have some of the original gilt left but not a lot. The snaps are a narrow style steel type which are not as substantial as the German type but I’m sure they worked well. If you have a fine Russian dirk from the 20s or 1930s this rigging would be an outstanding addition. This gray wool bag was originally with an imperial court degen. I bought the bag from a collector that did not want to keep it with his sword. The bag is 46 inches in length and is fairly narrow so that it can not really be used for anything other than a court sword as the hilt configuration is fairly small on this type of degen. The bag is of all gray color wool showing minor age and usage throughout the surfaces but has no holes and the stitching is all in good condition.